Sitawa Namwalie, Shan Bartley, and Yewande Omotoso were the final artists to feature at “Artistic Encounters” at the Goethe-Institut Kenya on Wednesday, November 21, 2018. 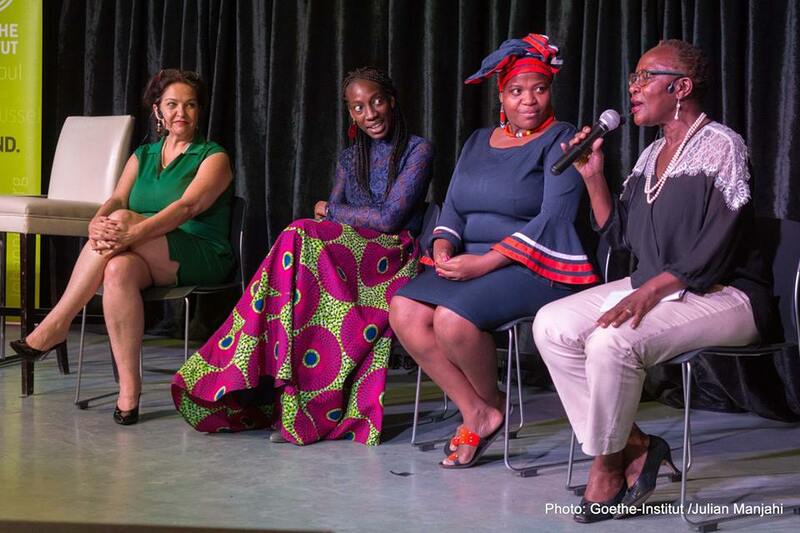 The event was moderated by series creator and curator Zukiswa Wanner. In 2017, a new series created and curated by Kenyan based South African author, journalist and publisher Zukiswa Wanner called “Artistic Encounters” started. The event hosted by Goethe-Institut Kenya would regularly feature two artists of different genres sharing their art together in front of an audience. In nine events over two years, Nairobi residents got to see some of the leading names in the African artist communities from Kenya, South Africa, Nigeria, Sierra Leone, Zimbabwe, Germany, and the Gambia. They included artist Victor Ehikhamenor, poets Koleka Putuma, Philipp Khabo Koepsell, Adipo Sidang’ and Dami Ajayi, as well as musicians Makadem, Prudence Katomeni, and Christine Kamau. The defining part of the series was probably the books Lola Shoneyin’s Secret Lives of Baba Segi’s Wives, Angela Makholwa’s The Blessed Girl, Niq Mhlongo’s Soweto Under The Apricot Tree, Pede Hollist’s So The Path Does Not Die and Olumide Popoola’s When We Speak of Nothing. These books were brought to life by storyteller Maimouna Jallow, actors Patricia Kihoro, Nick Ndeda, and Hana Kefela, as well as spoken word artist Ngartia. The Woman Next Door by Yewande Omotoso. Photo/Julian Manjahi, Goethe Institut. Hortensia James and Marion Agostino are neighbours. One is black, one white. And both are sworn enemies, sharing hedge and hostility which they prune with a zeal that belies the fact that they are both over eighty. But one day an unforeseen event forces the women together. And gradually the bickering and sniping softens into lively debate, and from there into memories shared. But could these sparks of connection ever transform into friendship? The book was visualised by spoken word poet and actor Sitawa Namwalie and Shan Bartley. Sitawa Namwalie is a poet, writer, and performer whose work includes Cut Off My Tongue a poetry collection from her reflections on ethnicity, identity, land ownership, dominion, and love. Her other poetry collection is Silence is a Woman. Shan Bartley is an actress, casting director, editing consultant, and contractor based in Nairobi. The evening started with a thirty-minute show picking scenes from the novel. After the show, there was a Question and Answer session featuring all the three, the two actors and the novelist, moderated by Zukiswa Wanner. There was a healthy showing of South African nationals at the event seeing as the book is based in the Southern African country. After the proceedings, Wanner announced that this was the last running of the Artistic Encounters at the Goethe-Institut to the shock of all who were in the audience. Fans would then get their copies of the book signed by the author. All images on this post are courtesy of Julian Manjahi/Goethe Institut. Yewande Omotoso. Photo/Julian Manjahi, Goethe Institut. Shan Bartley and Sitawa Namwalie. Photo/Julian Manjahi, Goethe Institut. Zukiswa Wanner. Photo/Julian Manjahi, Goethe Institut. Artist Victor Ehikhamenor and poet Koleka Putuma. Trumpeter Christine Kamau and poet Philipp Khabo Koepsell. Novelist Lola Shoneyin and storyteller Maimouna Jallow. Author Angela Makholwa and actress Patricia Kihoro. Novelist, short story writer, and academic Pede Hollist and actress Hana Kafela. Mbira player Prudence Katomeni and poet Adipo Sidang’. Novelist Niq Mhlongo and actor Nick Ndeda. Spoken word artist Ngartia and novelist Olumide Popoola. Nigerian poet Dami Ajayi and Kenyan musician Makadem. Previous Previous post: Nigerian Prize for Literature 2017 winner Ikeogu Oke has passed on.